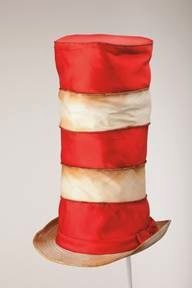 The Art of Dr. Seuss Gallery, Chicago’s newest and most celebrated art gallery is honored to present Hats Off to Dr. Seuss!. In celebration of the 75th anniversary of Dr. Seuss’s second book, The 500 Hats of Bartholomew Cubbins, Dr. Seuss’s never-before-seen hat collection will be exhibited from September 19 – October 12, 2014 at the gallery. This exhibition will also feature Dr. Seuss’s little-known Secret Art Collection, a series of Estate authorized works adapted from Ted Geisel’s original drawings, paintings, and sculpture, which will also be available for acquisition. Hats Off to Dr. Seuss! is a rare and exciting exhibition as this is the first time any of these hats have traveled outside the Seuss Estate. Meet the Art of Dr. Seuss Collection Curator, Bill Dreyer, on Opening Day of the Exhibition: September 19. Please visit www.drseussgallery.com or call (312) 475-9620 for additional information.